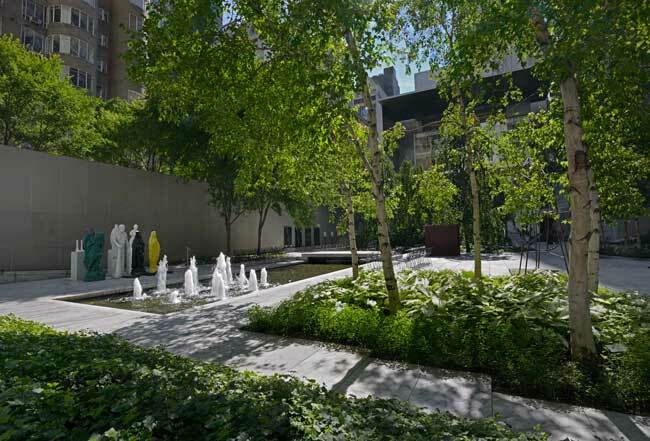 Now you can drop into the Museum of Modern Art’s Abby Aldrich Rockefeller Sculpture Garden during the new morning hours (9:00 a.m.to 10:15 a.m ). Just enter on W. 54th Street through the West Gate. Furthermore, admission to the garden is free. If you’d like, you can add to this inspiring good morning bonus by buying coffee and/or beverages in the garden. igures (including St. Michael, a Madonna, a giant, and a snake). Other sculptors represented in the garden Joan Miró, Alberto Giacometti, Henri Matisse, Mark di Suvero, Tony Smith, and Claes Oldenburg. For more information, about the museum, click here http://www.moma.org. The early morning hours in the Sculpture Garden will be in effect year-round, weather permitting. 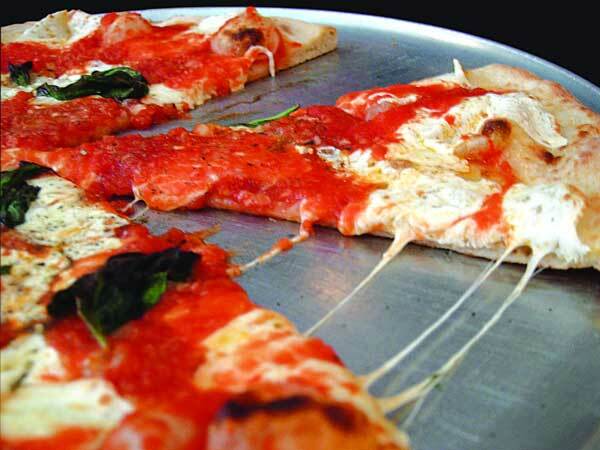 Led by true Brooklynite Tony Muia, the approximately four-and-a-half hour bus journey takes you to great moments in pizza history — Grimaldi’s (representative slice above) under the Brooklyn Bridge and L&B Spumoni Gardens in Gravesend. Moreover, it gives a nice, long look at the mysteries and intricacies of that mythic land, known as Brooklyn. It also motors over to Bay Ridge, Coney Island and various movie locations for such classics as Saturday Night Fever, Goodfellas, The French Connection, and Annie Hall. Even the crustiest of visitors have loved the tour. And the best part is that tour-goers start the journey in Manhattan. The better part is that everybody on the tour gets two slices and a soda at each of the two historic pizzerias visited. For more information call 212. 209. 3370 or click here. 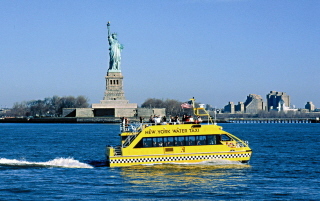 Water Taxi is a New York ferry and tour operator, and its starting point is Pier 17 at the South Street Seaport. The tour boat, itself, is a bright yellow (with strategically placed black checkerboard blocks) double decker catamaran. Traveler stood on line and overheard people worrying and mumbling, estimating their chances to get a seat on the top deck. Traveler raced on but chose seats below. Traveler couldn’t help it. The nice fat cushiony high backed seats were so appealing— you know, the European ones, old blue plush with all the red and yellow and blue and green sprinkles, like you find on the airport bus in Europe. At the start of our 90-minute cruise, Lee the Water Taxi Guide introduced himself and noted that those seated downstairs would soon have a chance at an uncluttered view by just stepping outside the cabin. But of course. What a relief. And what a triumph. Lee also served as the DJ. At various times during the trip, music shimmied out of the speakers. 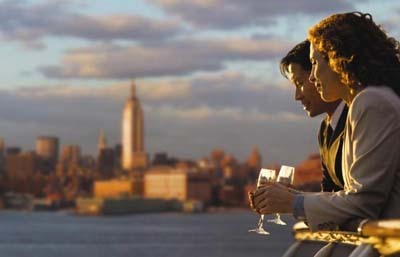 “Oh look, there's the South Street Seaport! Oh look, there's the Staten Island Ferry and Battery Park and Battery Park City, Oh look at the sun making glowing ovals that pop and sparkle off the colored glassy buildings.Adding spirit, structure, sound track and an extra sense of wonder to the game was Lee, the guide. He was describing the sights over the public Speaker system. It became apparent early in the journey that he not only was informed and eager to transmit his knowledge of the city and its harbor; but that he was delivering this homage in verse. Oh look, there’s Ellis Island and the Statue of Liberty. As we approached Bedloe’s Island, the home of the Statue, people started streaming out of the downstairs cabin. Lee said don't worry if you're on the wrong side of the boat because we're going to stop the boat and going to turn the boat around, line that statue up behind you and take your picture. Now a word about this. They actually stopped the boat for 10 minutes or more. The crew leaped out and offered to take your picture whenever you want with your camera. Could it get any more exciting? Yes! A man, wearing a forest green Abercrombie and Fitch T-shirt, emerged from the huddled masses on the deck, was handed a microphone by Lee and turned to a woman wearing a black and white blouse and pants. He looked into her eyes, and asked "do you want to marry me?" He handed her the microphone. From his pocket he produced a small box, opened it and presented the ring. There was joy all around. It seems they were German tourists, and he saw fit to pop the question in front of the Statue of Liberty. Now that's democracy in action. Traveler wondered if Lee were empowered to perform the ceremony, but apparently that did not come up. We sped away from the Statue of Liberty to the tune of Peggy Lee's "Fever." 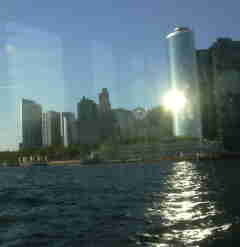 It looked as if we were making straight for the Staten Island ferry. But no... the water plays tricks on a sense of distance. Cheated death again! Now, a police helicopter flew right over our boat. As the sun grew more rosy golden, it was fun to go back and forth between the cabin and the deck. The breeze caressed; and actually having fresh air was such a refreshing surprise. Now they're playing nice oldies like the Supremes as the boat goes all the way up to the Water Taxi’s cute little beach opposite 35th St in Manhattan. The lights were twinkling on the buildings in midtown East Side Manhattan —the Chrysler building, Empire State building, the whole shebang. The silvery half moon above in the evening sky is the brightest light of all. Even the annoying red check logo of the Verizon building down by the Brooklyn Bridge doesn't look too bad..
And as we headed toward the seaport, the synth rhythms and operatic arias of Coco de Mer played on the sound system. The trip was a blast. The crew couldn’t have been friendlier or more helpful. Do you know somebody who's planning to visit York? Sure you do. Every week! We love to watch your eyes go boingggg boinggggg when they see our tall buildings and sense the excellence and intelligence of America's only truly international, grown-up city. We love to watch your auras explode when you taste our gorgeous food.. But what New Yorker wants to take a big-eyed, breathless first-time visitor up the Empire State Building for the 37th time at 8:00 a.m.? No, no, no, no, no. No more! So here's what you do: you buy your friend a CityPass. And when you take your friends for din-dins that evening they can tell you all about the rubber King Kong pencils they bought up there at the tippy top. No waiting on line either...with CityPass, your guests just waltz right in. Well, most of the time, anyway. The Empire State Building's a special case. It gets crowded up there, and King Kong's got a CityPass too. Your CityPass will get also you free admission to the Intrepid Sea Air Space Museum, American Museum of Natural History, Guggenheim Museum & MoMA, and more! So do it. 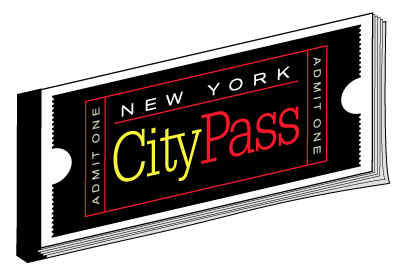 Click here for the CityPass website. 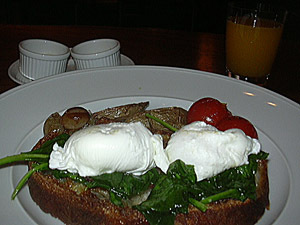 Eat in neighbourhood coffee shops, (in midtown, East side, close to the United Nations, these are on First and Second Avenues, where breakfast is $3 for two eggs, potatoes and toast, not $12 or more in the hotel tourist traps. There's a 24 hour supermarket on the corner. Walk to First Avenue between 53rd and 54th Street and you'll find all the Sutton Place regulars tucked into the comforting diner booths at the all nighter Madison coffee shop, or a few clicks down at Tal Bagel, where the tofu scallion spread on an Everything Bagel is actually just as delicious as the cream cheese. And so good for you. We have a big soft soft for the old Excelsior Hotel. It's on Central Park, so there's air there, too. What a concept! Unsurprisingly, Jerry Seinfeld, Tony Randall, and lots of celebrities, if you care about that sort of thing, live nearby. The Excelsior is located directly across 81st street, opoosite the new Planetarium, which looks stunning and awesome on the outside and is crushing and horrible on the inside (more on that disappointing debacle later). Just stay in celestial splendour at the historic Excelsior, where galaxies of wonderful sweet space scientists wander around in circles, jabbering to themselves, gawping at the beautiful blue ball glow eerily at night. There's a good coffee shop, and a subway and bus stops on the corner. Righteous, and still under 200 clams per night! You get more than a room when you stay at the Y. You'll find recreation, a concierge /tourist desk, swimming pools, and fitness facilities. And a cheap hotel. In New York City: Yes! Y not? You can stay at the Y in Hong Kong, Delhi, Athens, Bangkok, London and even New York. According to Wikipedia, "Hotel Denouement from Lemony Snicket's The Penultimate Peril was modeled after the Library Hotel." Traveler must be frank. This is not your rock ‘n roll hotel. It is calm, clubby and (like its namesake) a sanctuary. As soon as you enter this 60-room brick and terra cotta boutique hotel, you see that the hotel owner (HKHotels) used the library both as a geographical reference and a fountain of design. Say you’re in town to do a bit of business – maybe see your publisher. Wouldn’t it be great to stay in a hotel where you’d be proud to have a few appointments and meetings in a lovely, clubby setting? Upon check-in, the first things you see are a back wall which resembles an elegant card catalog cabinet, books in the lobby, and complimentary bookmarks waiting for you at the registration desk. The designers—the Stephen B. Jacobs Group and its affiliate Andi Pepper Interior Design—named the hotel floors and rooms for Dewey Decimal System categories. The fourth floor is Language; eighth is Literature; ninth is History. The rooms are sub-categories. Traveler stayed on the General Knowledge floor (okay, the tenth) in 1000.006, the “New Media” room. The “.006” means it is a junior suite. (Bear in mind, when you’re booking, that rooms numbered “.001,” “.002” and “.005” are “deluxe rooms;” “.003” and .”004” are “petite” rooms. The official “Love Room,” by the way, is1100.006; but any room can be set up temporarily as a love room as part of a special package. For the room menu, click here. And, yes, there are books galore, special ones, in every room. Our junior suite’s own little library is chockablock with books – all related to New Media, including Clicks and Mortars, What Liberal Media?, and Fast Forward. Our New Media room, like the hotel, is quiet, classy, civilized and gemutlich, It is done in hushed but cheerful tones of tan, sand, beige, brown and white, with a checkerboard patterned carpet in hues of stone and sand. Pale wood blinds dress five windows, which is amazing for a New York hotel room. Two windows look all the way up and a bit of the way down Madison Avenue. You’ve a long marble-topped workspace for fiddling with your laptop (with a handy outlet above the desktop level), collating reports, or meditating on your collection of tourist brochures and the snacks you bought at the excellent Grand Central Market (it’s in the station). The usual amenities plus are here: flat panel TV; safe; down blankets; sofa (which pulls out to make an extra bed): waffle bathrobes; slippers; hand held hairdryer; iHome mp3 dock/alarm clock radio; multiple phone lines (and phones) with voice mail are here. A DVD player is standard equipment in each room and there’s no charge for the DVDs you borrow from the hotels DVD (-er-) library based on the American Film Institute’s list of top 100 films of the 20th Century. But why would you? Grand Central Station is awesome, and just round the corner. Shampoos and goos are Zero% brand (no sulfates, no animal testing, thank heavens, pure, odorless, but not much fun) from Gilchrist and Soames. Alas, it is necessary to request a shower cap. (Apparently, the many Europeans who stay here do not bother with such frivolities.) Sorry, tourists – no coffee and tea maker in these rooms – but you can get a cuppa 24/7 at the most amiable “Reading Room” on the second floor. Lingering over coffee, newspapers and magazines is encouraged— and what divine, unlimited coffee, cappuccinos and espressos they are. The Reading Room, too, has its fair share of books, mostly best-sellers and popular page-turners. It’s got a library vibe, except nobody’s going “shush.” And you can stare at Madison Avenue through the large windows. Speaking of free stuff, also included are: free WiFi throughout the hotel; free bottles of water on arrival; free coffee, baked goods and fresh fruits served all day; daily evening wine and cheese receptions (5:00pm - 8:00pm); the free “European style” continental breakfast buffet. The Library Hotel doesn’t have an exercise room; but it does provide guests with a free pass to a sports club a short hike away. 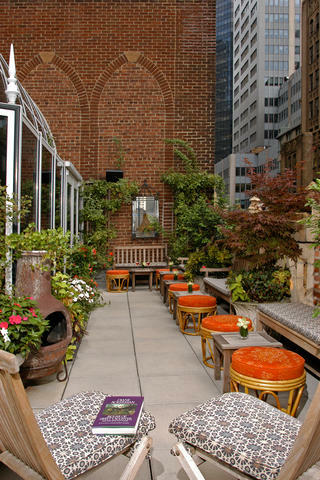 Up top on the 14th floor is the Writer’s Den, a mahogany-paneled lounge with a working fireplace, a nice bar, and surprise, surprise, a pretty Poetry Garden, an enclosed rooftop bar with wraparound terrace (see right). At sunset, you can watch the skyscrapers play their dazzling, secret little games, bouncing wild red-orange lights off one another. You would never see this from down below, and it makes you wonder what these buildings get up to when no one’s looking. The Library Hotel is artfully located. It is a only few blocks but many decibels away from the frantic West Side Broadway action. It is only a few blocks away from the United Nations, a leap from the elegant Grand Central Station and —crucially — it is just one block from the Airport coach, you know, the big bus that takes you to whatever airport you need. If you are coming in, exhausted, from a long flight, you’re just steps from where the airport buses drops you off. And if you need a 5.30 am bus to take you to the airport for only a few bucks, Bob’s your uncle: No taxis, no nerves, you’re right here. Bus stop, located at 41st Street between Park & Lexington Avenues, goes to Newark. Bus stop at 125 Park Avenue, between 41st and 42nd Streets, is for both JFK (JFK) and LaGuardia (LGA) Airports. Living in midtown means never having to say “Taxi!”. Step out the door and you’ll find the city buses that take you to toney Madison Avenue boutiques and art galleries, as well as the fabulous museums that populate Manhattan’s Museum Mile. Or grab the crosstown bus on 42nd Street and zip over to the Theatre District in Times Square. 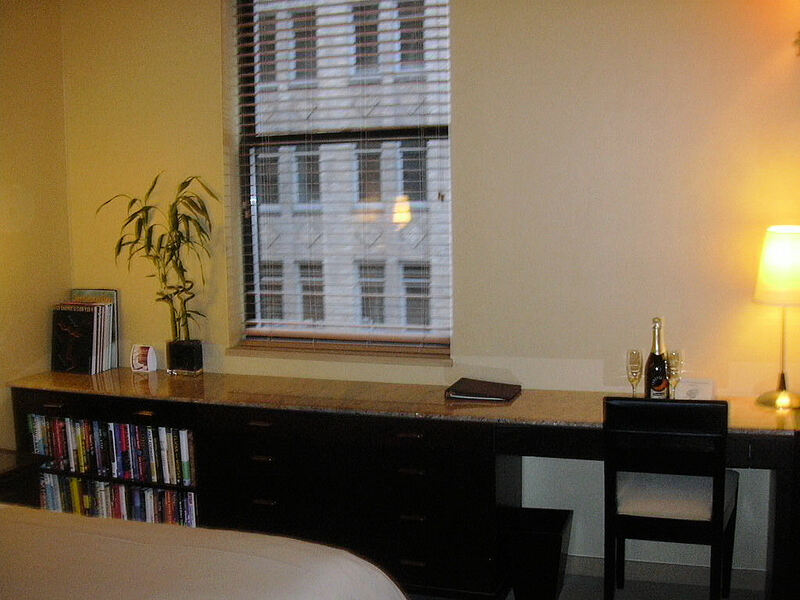 For more information about the Library Hotel, click here. If you haven't yet run the gauntlet, you really must take a walk along Sixth Street from Second Avenue to First Avenue, Manhattan's “Little India.” Peer into the restaurants, as you are “invited” by the many restaurant owners to step inside their wildly lighted establishments. The food's pretty much the same — better than average, at least — in all of them. Some folks favour Ghandi, some prefer the always reliable Mitali East. And those who don't know any better get sucked into Banjara, perhaps because it's more expensive, and many people in this country (including, unfortunately, the Zagat and New York magazine reviewers) don't know Indian food very well and can't tell good from the average. If you want a thoroughly delightful Sixth Street experience, turn to the right when you reach First Avenue, and walk a few steps, where now you will see four - count them, four! - Indian restaurants, two up, two down, all good, and festooned with the wildest flashing lights of all, some of them, winking, blinking red chilli peppers in endless rows. Surprise, surprise...this one features a cpsychedelic forest of glittering lights. They're like Christmas lights except they take the form ofchili peppers.A great place to delight your friends, have a party, or throw one of those buy-your-own-damn-dinner parties that are becoming increasingly popular these days. Lunch special is $.95 and $.95 and includes a pappadum, soup, samosa, banana pakora, bhujia, eggplant pakora, a curry, rice, dhal, and dessert! click here. This world famous pit stop (since 1976) for taxi drivers, film stars, Indians families, homesick diplomats and obsessed nutcases like your reviewers who once in awhile wake up and must have the full smorgasbord of Indian dishes for breakfast at 11 o'clock in the morning is not to be missed. In you come, look at the Big Board above, and point to all you want. They load it all onto a tray and then you teeter up the narrow stairs, where, waiting for you is a room full of tables and another buffet. We're not talking high gourmet dining here, but the pakoras are stunning and the dishes are the real thing, home cooking, perhaps, just like Rama used to make. Travel tip: Get take-away samosas for a picnic on the plane, or to stash in your mini bar for a jet-lag snack. Click here. You can always count on Bombay Palace to serve you a delicious, superior excellent meal...it almost guarantees excellence in every dish. If you need to take someone to a special lunch at a moment's notice, the cooking will never let you down .The rooms are constantly being renovated and glitzed up and convey a casual sense of occasion. People feel flattered to be asked to join you here. Bombay Palace is an international chain. The up side to this is it has extremely high standards. Nice stop for Fifth Avenue shoppers or midtown execs. I like to "test" Indian restuarants by ordering difficult, variable dishes: Mattar Paneer is a case in point. The peas should be bright green, not army coloured. The paneer should be large, plump, rectangular, soft and taste of rosewater. Bombay Palace's always passes the paneer test, where hardly anyone else does. They sell their own cookbook: a must have. & The Bombay Palace's approach has a brightness and confidence and gourmet swagger, a genuine polish that makes you want to eat these foods every day. We've got three copies, and whenever we go into the hinterlands, the book goes with us. (Want to buy the book?) Go here. IIf you've got to have an Indian meal right away, you could do worse. The cooking has a harshness to it, and some dishes are too oily. Two tricks here: 1) Diners are entitled to a free basket of pappadums, but you have to know to ask for them, or you're out of luck. 2) At lunch everything on the menu is 50% off the listed price. This seems a silly practise - why bother going there for dinner? Tips: Paneer Tikka makes a great starter, The veg kurma tastes good, though the sauce is thin and runny; the veg jalfrezi is too sharp. Veg kofta is terrific, and those pappadums are worth fighting for...they're very nice, washed down with a salt lassi.Click here. Many visitors to New York assume it’s an adult playground. That’s true, but that’s also a myopic view of America’s most interesting city. Manhattan is a wonderland for kids. You can take the family to the usual sites—the Statue of Liberty, Central Park and the Empire State Building—but for a truly family vacation, branch out. The choices are infinite, but here are a few to spice up your itinerary. No city in the world has better theater than New York. So head straight for Broadway musical "The Lion King" at the New Amsterdam Theater, 42nd and Broadway. "The King" is an artistic triumph, the music, set design and costumes are a feast for the eyes and ears. It’s safe to say you’ve never seen anything like it. 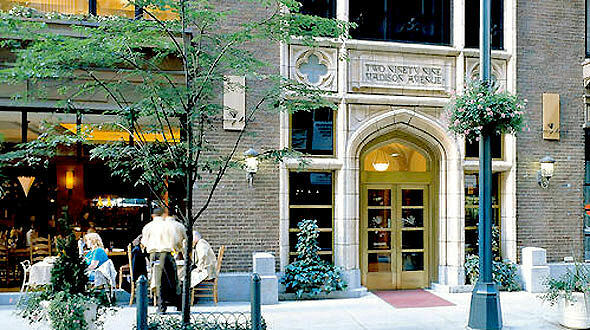 The Andaz Wall Street is a couple blocks from the South Street Seaport and a couple blocks from Trinity Church. A few more blocks and you’re at St. Paul's Church and Century 21 department store (a shrine for Euro bargain hunters).' It is in the heart of an NYC beehive; and when you step inside, you feel as if you are definitely in New York but at rest. At ease soldier. Hyatt’s Andaz brand is defined not so much by price point (although it gives plenty of bang for the buck), as by the indie spirit. Pampering but not luxe; cost-saving but not shabby. It’s kind of just right. Goldilocks would love it. Each Andaz hotel is designed to be awash in the local vibe. This location, designed by David Rockwell and Rockwell Group, conveys the 24/7 activity of New York City and yet offers comfort and ease to its guests. All the bustle and none of the hustle. A smiling “host,” carrying an ultra small laptop greets you. Don't worry. The host won't ask you to sign a petition. Instead he or she will take you to comfortable chairs in the airy, cheery Lounge (a/k/a/ lobby) and offer you wine, soda, juice or coffee, and then gently check you in. Hosts also carry your bags, give information and act as concierge. The Lounge has an intimate feel. Guests can gather here for a welcome (and complimentary) croissant, coffee, little snacks, juice and wine (depending on time of day).. Wait a minute! Something is missing here. The stylings are contemporary. Art is all over the place: but... but where’s the 'tude. Allow yourself the faintest of smiles. The guest — that's you — is the one who is cool here. Yes the Andaz Wall; Street hotel is modern. But its corridors manage to have pinstripe grey walls without being gloomy. 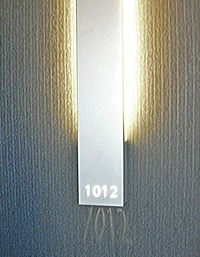 The lighted room numbers are beamed onto the doors. Welcome to room 1012. While the hotel leans toward the minimalist, it never takes you into frost territory. With white walls and black tiles, plenty of whites. blacks and greys meet the eye. They are tempered by textures or patterns or both. The space ordinarily would be a suite divided into separate rooms. Instead it suggests New York style loft-living. Discreet areas have clearly defined functions. The. pale ash furniture both pleases the eye and is utilitarian. A long blonde table, bridging office and sleeping areas, serves several roles. 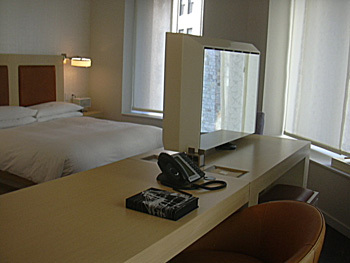 A 42” flat screen TV rests on the section facing the bed. Beneath the TV are the fridge and safe. 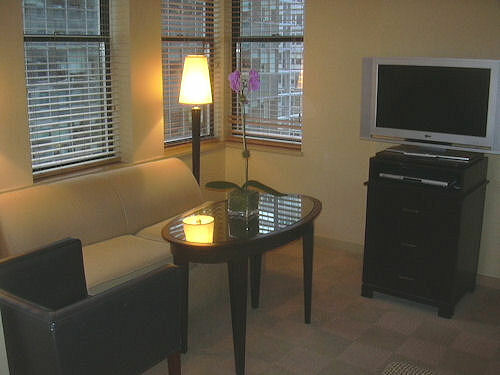 (By the way, minibar snacks and nonalcoholic drinks are free as are wireless Internet access and local phone calls.) The other side of the table serves as desk and vanity table. The telephone and so-easy-to-access electrical outlet on the work surface make it fun to play office. Under the adjoining table section is a bench facing a mirror. Actually the mirror is mounted on (are you ready for this?) the back of the TV screen. The –ahem- facilities are separated from the rest of the room by a glass door. Like Gaul, the WC is divided into three parts. In the center is the sink and all that serve it. Turn left and go through the glass door for the shower and its rainfall showerhead. There’s another glass door to the sink’s right and that leads to the commode. 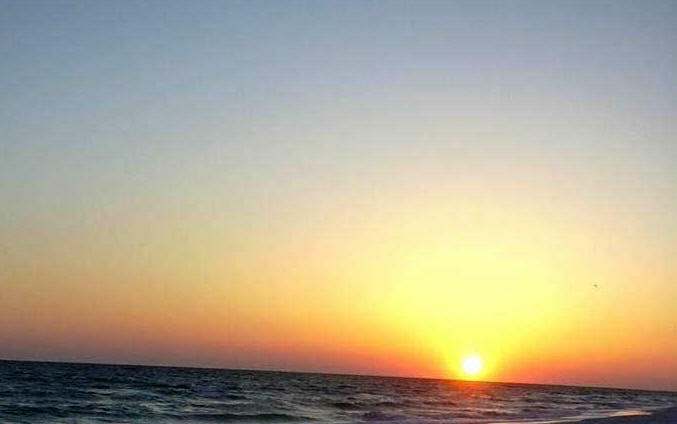 What solitary bliss! Toilet amenities are nice big aloe goos and gels. There’s no shower cap, but they cheerfully will bring you one, and toothpaste and extra pillows on request. Traveler not only has an airport hotel fetish but a pillow fetish. The Andaz pillows are made by San Francisco-based Down Etc. .Enough of sleep. Traveler must work. Opposite a Bolton’s, a Duane Reade drug store and a Verizon shop is a hidden haven, the hotel’s restaurant, Wall & Water. It offers seasonal dishes, crafted from regionally sourced ingredients. Traveler chowed down in the final days of the restaurant’s winter menu.. Again the word intimate arises. With its roomy, open, stainless steel kitchen, the dining area is divided into three sections: the 12-seat chef’s table by the kitchen, the main dining room, and a lovely private dining room. The main dining room has a goodly amount of olive-toned banquettes. The live wood tables are made of Guanacaste. Tipped Mirrors up high reflect the street views revealed by large windows, and give a subtle sense of constant activity. Oh, look! There goes a taxi. Traveler did not have to search for vegetarian dishes. They had a menu category all their own, a list of three selections (two more than you often find in other places). For the winter menu, chef chose a lot of humbler vegetables and did them nicely. Although not a fan of root vegetables, Traveler appreciated the preparation. Gabi, our server was marvelous. We followed her suggestions and were not sorry. Breakfast also is served at Wall & Water. You can have your eggs Florentine with Hollandaise or béchamel sauce. Traveler opted for both. Traveler loved the spherical poached eggs —so very outer space — and the accompanying cippolini onions and grilled cherry tomatoes. The personable Kevin McQueen excelled as our breakfast server. So Traveler slept, ate and hung out in the Andaz Wall Street. We should add that the place has a new spa and fitness room and some marvelous meeting rooms. At its opening in 2010, Andaz was the only hotel on Wall St. That’s nice; but more distinctive is that it’s a relaxing place to stay.